Doxa Youth Foundation Cadet Alumni and V/Line employee, Michael Perry, with his mentee and current Doxa Youth Foundation Cadet, Rabel Kaka. We recently hosted our annual Doxa Youth Foundation Cadetship Alumni event to provide our Alumni with the opportunity to re-connect, share experiences, network, meet current Cadets and also hear some inspiring stories of success. 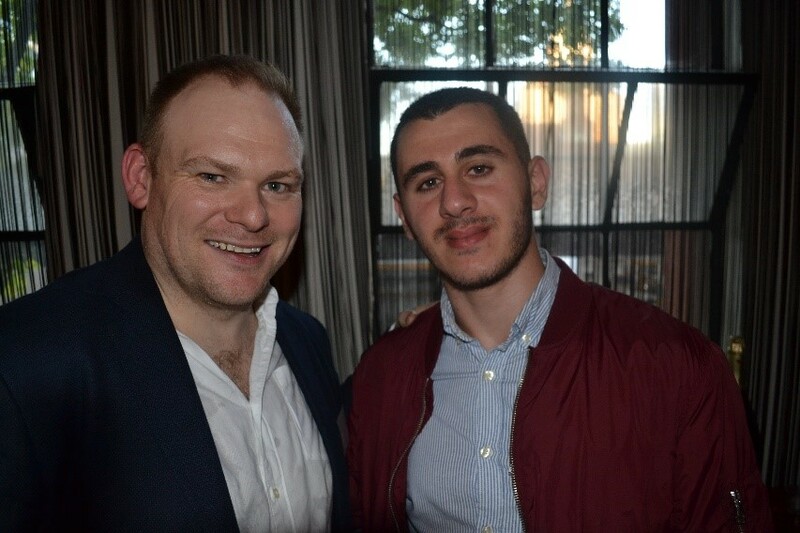 Our guest speaker on the night was Michael Perry, who shared how Doxa Youth Foundation changed his life and informed his passion for mentoring young people, including Rabel Kaka. Michael Perry was a Doxa Youth Foundation Cadet in 1999. Like many of our Cadets, Michael experienced challenges growing up and the Cadetship program was an invaluable support during his three year accountancy degree. Fast forward 20 years and Michael is now working at V/Line and mentoring next generation Doxa Youth Foundation Cadet, Rabel Kaka. Michael shared fond memories about the comfort he felt knowing Doxa and his sponsor company took care of barriers, including the cost of text books, tutoring for subjects he struggled in, the Malmsbury residential camps and even his first business suit fitting. What’s more, Michael’s mentor at his sponsor company was a Cadet Alumni too so she got it, she understood Michael and what he was going through. Michael is now working at V/Line, leading a team and recently, he’s taken on his own next generation Doxa Youth Foundation Cadet, Rabel Kaka. Rabel’s family left Iraq about 5 years ago due to the imminent threat from ISIS, who had raided the next-closest village to Rabel’s home. Rabel came to Australia with no material possessions . As a refugee he experienced financial hardship as well as culture shock, isolation, loneliness and struggled with English during his first years in Australia. It was extremely hard to make friends and Rabel didn’t feel like he belonged anywhere. Great cadets make for great graduate employees. Cadets leave university with at least 6 months of relevant work experience, not to mention their networking skills, employability skills and professional development, so they are going to have the competitive edge over their peers. Also, what better way to recruit ready-made assets into your business? We are looking for organisations to support our 2019 Cadets and we would love to hear from you. Many thanks to Rabel and Michael for sharing their story at the Alumni event and in this blog and to V/Line for their ongoing support. If you are interested in supporting a Doxa Youth Foundation Cadet at your organisation, please get in touch with our Cadetship Manager, Michael Walter: mwalter@doxa.org.au.